The United States Anti-Doping Agency (USADA), Anti-Doping Denmark (ADD), and Anti-Doping Authority Netherlands (Doping autoriteit), announced today that a three member panel of the American Arbitration Association North American Court of Arbitration for Sport (AAA), rendered its decision in the case of Dr. Geert Leinders, of Belgium, imposing a lifetime ban for his doping violations committed while he was the Chief Team Doctor and a member of the Board of Directors for the Rabobank professional cycling team. The investigation of Dr. Leinders began with the discovery of evidence by USADA in 2012 during the course of its investigation of doping in cycling. This case was collaboratively investigated by the collective group of independent national anti-doping organizations as part of the ongoing investigation into the culture of doping that infiltrated the sport of cycling. After a hearing at which the detailed evidence, including eyewitness testimony, corroborating documentation and an expert analysis of abnormal blood values of cyclists was presented, the independent Arbitration Panel found that Leinders possessed, trafficked, and administered banned performance enhancing substances and methods without any legitimate medical need, including EPO, blood transfusion paraphernalia, testosterone, insulin, DHEA, LH and corticosteroids to athletes under his care, and was complicit in other anti-doping rule violations. The Arbitration Panel agreed with the charges that the alleged doping offenses involved aggravating circumstances, which justify a lifetime period of ineligibility, stating that “As the chief team physician and a member of the board of directors for the Rabobank cycling team, Dr. Leinders occupied even higher positions of trust and responsibility…,” than other athlete support personnel, including trainers, coaches and team physicians, who have been sanctioned in the past due to their involvement in doping conspiracies. 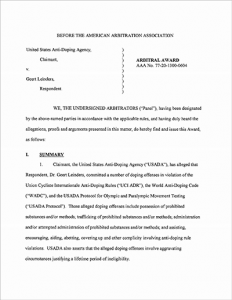 Under the restrictions of this sanction, Leinders, is and will be prohibited from training or advising athletes and participating at any event sanctioned by USA Cycling, the International Cycling Union (UCI), or any other WADA Code signatory.